I have been to numerous sake tastings and there are several things I can count on: (a) delicious sake, (b) a group of interesting ex-pats who are passionate about drinking it, and (c) a moment of anxiety when I see a sake label. I cannot easily read the labels and so to remember a favorite sake from a certain kura (sake brewer), I must take a photo of the bottle. My photos of sake labels are often blurry, because I am myself, at that moment, a little blurry. 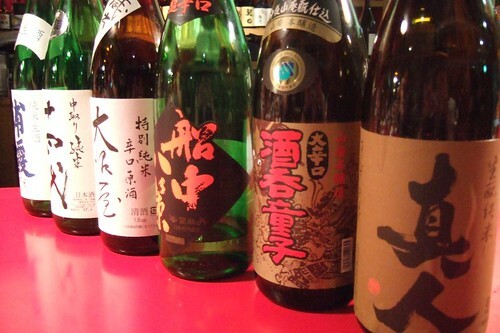 Sake bottle labels are designed with a range of graphics styles from hyper-modern to reproductions of traditional art. Many labels feature the simplicity of beautiful shodo (calligraphy) on washi paper. All of this one can appreciate without reading the text. Still, there’s a lot the illiterate foreigner is missing. I have taught myself some of the vital label kanji that state the grade of sake (junmai ginjo, honjozo, daiginjo). It would be anti-social to have my nose in a kanji dictionary all night at a sake tasting, so I just take the photo and move on. Even if I had the dictionary, however, some sake names are written in old kanji that is not listed in basic dictionaries. So much for the pity party. Here’s how I battle my illiteracy in general: today I spent two hours deciphering the entire recipe for an eggplant dish. Two hours, a cooking magazine, a Japanese-English dictionary, and a kanji dictionary to painfully translate how to make “lightly fried eggplant in broth.” No kidding, just when I was about to throw the magazine across the room, I came across a sentence that I could read without the dictionary. I stared at it with tears in my eyes. If you think that must be hyperbole, then you have never studied Japanese. I think reading sake labels are really tough. I often ask people how to read them or sometimes call kura to check. I wish you a happy new year and more sake drinking opportunities in 2008!